The route traverses several historic roads, streams, and localities. Indeed this is an opportunity to highlight some “paved over” history now forgotten within suburbia. Washington Metro has done just that on other lines, with names like Fort Totten (and let’s not forget the squares and circles named after famous leaders to include Civil War generals and admirals). Station 1: The favorites are McLean, Tysons-McLean, and Scott’s Run. But how about Lewinsville? Can I get a loud “Here! Here!”, Ron? Station 2: With the large mall complex nearby, the name Tysons Corner is hard to beat here. But let me suggest Chain Bridge Road, in honor of the ancient thoroughfare at that stop. Station 3: Just to the southwest of the station’s location along the Leesburg Pike is Freedom Hill. What a great name for a railroad station! Station 4: Not that we need a station so close to number 3, but if they must then I say name it Leesburg Pike. Station 5: The cross street here is Wiehle Avenue. While I admit that name will likely register with us who frequent the area, I’d like to see it named for nearby Difficult Run. Station 6: The station is near Reston Town Center. How about a wave to the Washington & Old Dominion Railroad trail just a short walk northeast? The old Sunset Hills Station stood nearby. Station 7: Herndon is the favorite and I see no reason to argue. The station there saw considerable activity during the Civil War. Station 8: I am leaning towards Coppermine, in honor of the 19th century mine located nearby. But we might mention Laura Ratcliffe and Mosby’s Rock. Those are the eight scheduled for this extension of the rail line. In the future there will be two new stations beyond the Dulles Airport, in Loudoun County. Both of those stations have a wealth of historical place-names nearby. Even if you don’t live in the DC area, you can take the survey. So please take a few minutes to help me stuff the ballot box! H/T to History Girl, a.k.a. AlexNovaHistory. A bit… OK… a good bit off topic for me – World War II. Recently I discovered Ray Harris’ The History of World War II Podcasts. Thought I’d mention his excellent work as there are a few readers out there who’s focus is in that direction… and a good number of us who really need to diversify our military history! Ray’s approach is somewhat different than other podcast series on the subject. Instead of touching upon several different aspects of the war, he takes the listener through major events or campaigns providing both a macro- and micro-viewpoint. For example, over the span of six episodes Ray covers the Dunkirk evacuation. He addressed the rather sticky situation between allied Britain and France, the failures and successes in German high command, all the while detailing the daily operations in the port and on the beaches. He devoted a full episode to the destruction of the French fleet in 1940. As I’ve mentioned before I am rather familiar with that topic, having written my thesis on Operation Catapult. I found Ray’s coverage well rounded and complete for the allotted time slot. Currently he is working through the Battle of Britain. The last few episodes have covered the opening actions in that air-battle – three days at a time. Beyond just the standard trip through the Battle of Britain – Hurricanes, Spitfires, Me 109s, radar, Fighter Command, Goering, the Blitz, perhaps a bit about tactics, and then “the Few” – Ray’s approach walks us through the changes with strategy and tactics, all the while pinned against the backdrop of two nations at war. The listener is not lost in the weeds discussing the aircrews and aircraft, but not held too high aloof considering the national leaders making grand decisions. Ray’s got a great series going. Even if you are only into Civil War history, these are good entertainment, providing some “rounding out” to your podcast library. 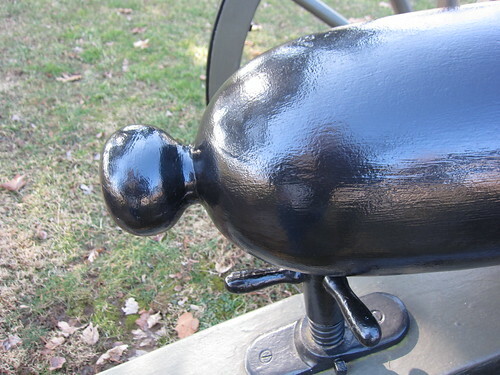 The average visitor to Gettysburg will stand beside this gun without pause, thinking its a real, authentic Civil War field piece. But on close examination this gun is not an authentic Civil War weapon. Instead this is a replica which dates to the early days of the Gettysburg park – one of perhaps a couple dozen cast for the Gettysburg commission in the 1890s. 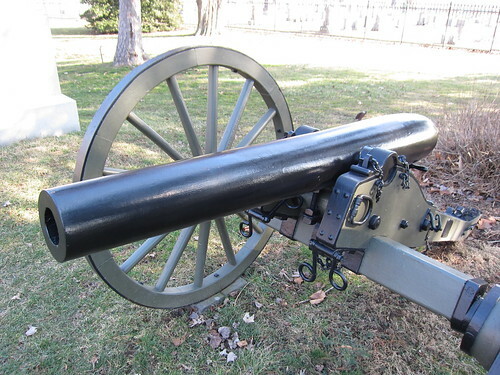 This particular gun represents the 1st Massachusetts Light Battery, along with an authentic 3-inch Ordnance Rifle, in Gettysburg’s National Cemetery. 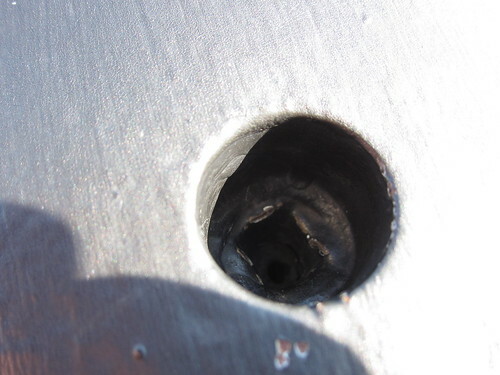 The bore has crude rifling and very poorly masked machining marks. 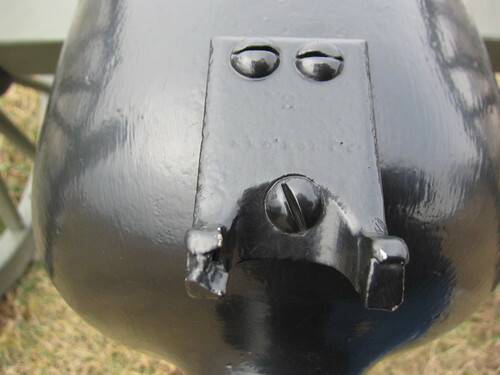 Some examples have irregular or off center muzzle faces. And of course these lack any markings. Likewise the trunnions have flaws which could not escape even the most lenient ordnance inspector. But most notably, the breech profile differs from authentic 3-inch Ordnance Rifles. 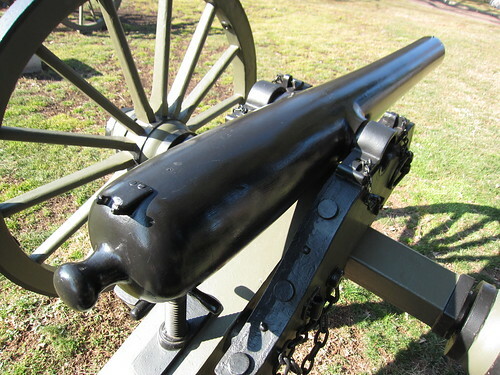 The elongated breech better resembles some Confederate guns or perhaps Blakely field guns. The generously rounded knob joins the breech with just a hint of neck. Compare this to an authentic 3-inch Ordnance Rifle just steps away. From a distance, the replica resembles the authentic gun well enough to fool most observers. But on close examination, items such as the squared rimbases, lack of sight fixtures, and breech profile give away the reproduction. Like the Parrott replicas I mentioned some time back, the 3-inch rifle replicas are products of Calvin Gilbert, a veteran of the war and a captain from the 87th Pennsylvania who operated a nearby foundry. When the Gettysburg commission came up short on 3-inch rifles to represent all the batteries on the field, they turned to Gilbert. In addition to the 3-inch and Parrott replicas, Gilbert also “falsified” 6-pdr smoothbores and James rifles into Napoleons. Now days we accept plenty of replicas and reproductions on the battlefield. Some better than others, but a necessary allowance due to the limited number of artifacts that remain. Gilbert’s guns were the first attempt at such a reproduction – over 100 years ago. While not “authentic” pieces, these guns have a history and story to tell. If you haven’t noticed, I’ve taken some time during my visits to Gettysburg “getting to know” the 3-inch rifles pretty well. My goal was to compile a list of markings and other features as I entice the stories from the guns. One set of markings has me stumped. 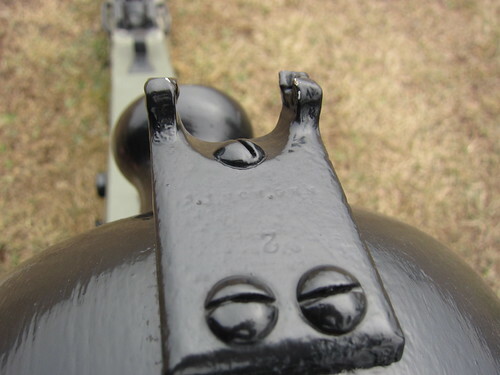 Take a look at the hausse seat on the back of an Ordnance Rifle near the angle. Here’s the seat from the front. The number “2” is clear. The smaller stamp appears to read “3INCHGUN”. 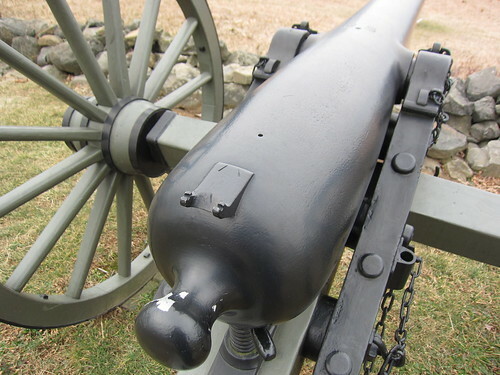 The stamps appear on other guns at Gettysburg. Number “4” is nearby. I’m curious about the significance of the numbering. I’d be shocked if the number was the serial number of the seat (what are the odds that 2 and 4 are nearly side by side at Gettysburg?). Were the numbers perhaps an indicator of the gun’s assignment within the battery? In other words indicating the 2nd and 4th guns in their respective batteries? The screws attaching the seat appear to be post-war. 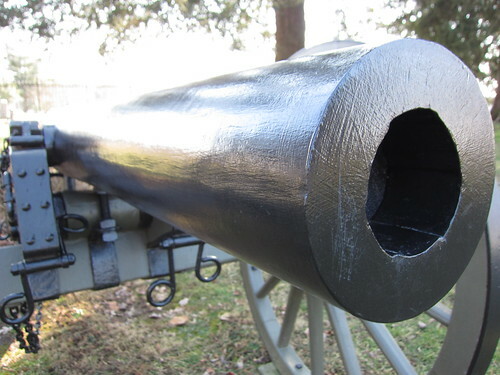 Perhaps added after the guns arrived at Gettysburg as part of routine maintenance. Most other 3-inch rifles have flush screws, for obvious reasons. Few others have the stampings on the seat. Perhaps the stamps seen on #758 and others were part of a localized convention – maybe set at a specific armory or installation. Since only a handful of guns have the seat stamps, the practice must not have been widespread. If any readers have any additional information on the hausse seats or stampings, please do drop a comment here. Who needs that ‘lectric map? We’ve got the Cope Map! 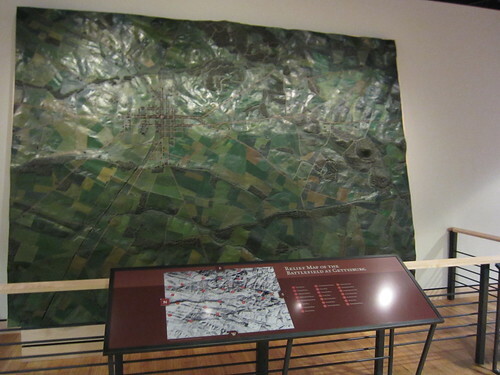 For generations of visitors, the electric map at Gettysburg was THE most important interpretive exhibit. The human brain has difficulty assimilating the massive amount of data required to understand the “real-time” flow of a battle. (Perhaps doubly so for participants!) Thus the need for “big picture” interpretive tools such as operational or high-level tactical maps. When the Gettysburg Visitor Center moved to the modern facility in 2008, the map didn’t go over. Several reasons were offered, but chiefly the map just didn’t fit into a 21st century interpretive program. I agree with Kieth Harris on the map – sure the presentation was a bit dated… need we say campy?…. but it was part of the Gettysburg experience. Recently there’s been some discussion of long term disposition of the map, but concerns about the exhibit’s size and asbestos have any plans for public display on hold. But THAT map was not the original Gettysburg electric map, but rather a rebuild from the time of the Centennial. Joseph Rosensteel built the original in the late 1930s. That map operated until 1963 or so. Proving the map’s value as an interpretive exhibit, after viewing the map with President Dwight Eisenhower, British Field Marshall Sir Bernard Law Montgomery remarked, “so, Ike, now do you realize why I was so reluctant to make some monstrous assault on Jerry?” …. No, I’m making that up…. but Ike and Monty did spend some time with the map. Emmor B. Cope, the Gettysburg Park Commission engineer, created this map for the St. Louis Exposition of 1904. The map provided, in three-dimension, the platform for an overview of the battle. The map also shows Cope’s “footprint” on the field – the park road system that he engineered. Of course Gettysburg Grognards will also link Cope to the 1890s survey of the battlefield and other important milestones from the park’s creation and early development. 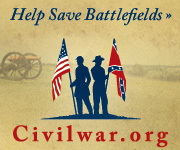 Cope drew upon his experience in the war to provide later generations several important resources. Those who look beyond things Gettysburg also recall his map work for Antietam and engineering at other battlefields. Now my question is why stick the Cope Map all the way in the back of the Visitor Center? Then again, located near the exit from the museum portion of the center, maybe tour groups can better utilize the resource. In the end, I think the days of these large interpretive maps are gone. Today I can walk the field with a hand-held device which provides minutia details of the action, along with the “big picture.” Perhaps a restored electric map would just be an anachronistic throwback, ignored by a crowd of smart-phone-enabled visitors. 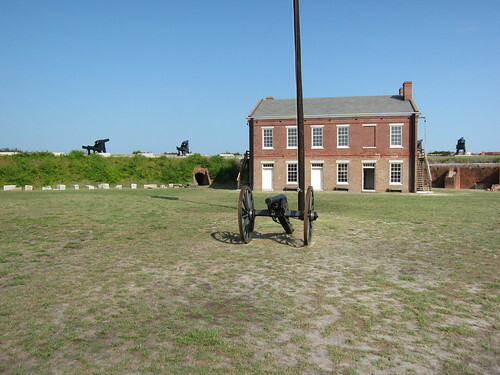 Fort Clinch, Florida, on the northern tip of Amelia Island, is a great diversion for Civil War enthusiasts (and beach-goers). Among the attractions is a 3-inch Ordnance Rifle, which was setting on the fort’s parade ground during my visit last summer. There’s no doubt Phoenix Iron Company produced this gun, as all the stamps are there. The muzzle has the registry number 650. The registry number puts this gun in the “later batches” of Ordnance Rifles. However, as I’ll show below, conforms to the “middle batches” of the type. Normally that would be worth explaining all by itself (as it “tests” the groupings I’ve offered for the gun types). But I also need to mention the bore… or lack thereof. The bore is clean, relatively speaking, indicating very limited if any actual service. I’d even speculate the bore out was done to reline the gun. But why one would do that is beyond me. The gun has worn surfaces all over and not something I’d want to restore for shooting. And take a closer look at those surfaces. Perhaps a little rusting pealed back the machine smoothed surfaces. 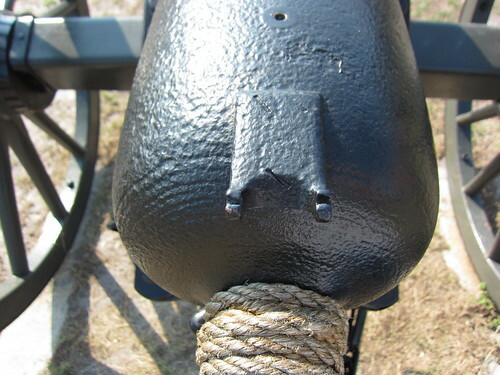 What appears around the breech are layers of metal. And a nicely bouched vent stands in contrast with the otherwise rough surface. 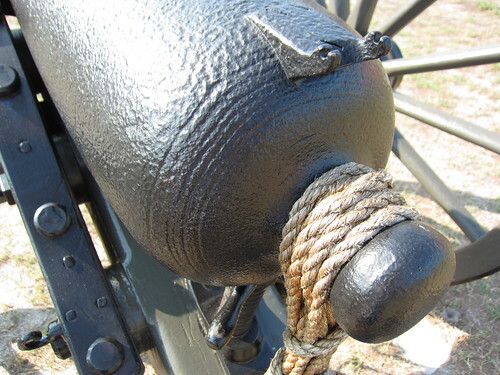 The barrel’s surface shows even more details of the layering of metal. Almost as if someone sliced laterally through the upper layers of a fruit roll-up! Phoenix made this gun using Reeves’ rolling technique. A line around the rimbases may be the seam left when those were welded onto the barrel. Maybe the lines are due to poor quality control in production. Or perhaps just enough rust ate away at the surface to reveal what lay beneath. Taking a closer look at those, notice the “N.J.” where usually we see a “U.S.” acceptance mark. 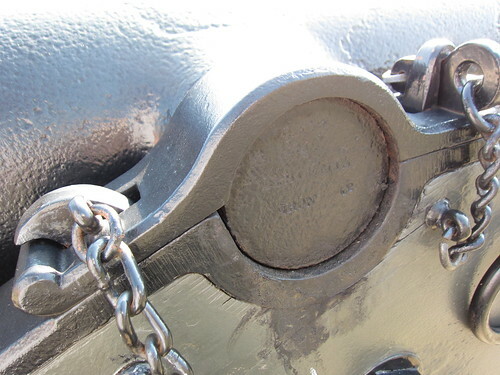 And there’s a hole for the auxiliary sight, indicating this is a “middle batch” Ordnance Rifle. This gun has a lot of explaining to do! First off there are several surviving Ordnance Rifles with the N.J. stamp. Clearly New Jersey purchased some of the guns (after all Phoenixville is not far across the Delaware River). Three of those guns with N.J. stamps have duplicate registry numbers with survivors with U.S. acceptance marks – 649, 650 (here), and 651. 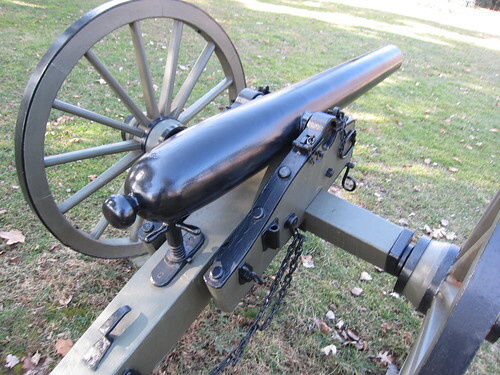 The U.S. guns are in a set received in November 1863. So here’s my speculation. Perhaps number 650 was among a set initially stamped at Phoenix Iron Company, but for some reason the ordnance officers rejected it. The “wavy lines” may provide a clue, indicating some irregularities. Later the New Jersey militia, not being as picky as the U.S. Army, might have purchased this gun at a cut rate. Such might explain the auxiliary sight, which by my estimates was discontinued in March 1862, as well as the duplicate registry numbers. But again, that’s just my speculation. 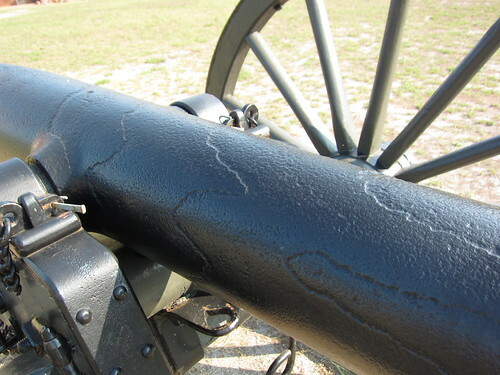 Regardless, the 3-inch Ordnance Rifle at Fort Clinch offers in interesting study to say the least. Bouching a gun is fixing a pure copper vent into it; which is done by drilling a hole in the piece, where the vent is usually placed, about one inch in diameter, and screwing therein a piece of wrought copper with a vent of two-ninths of an inch through the center of it. 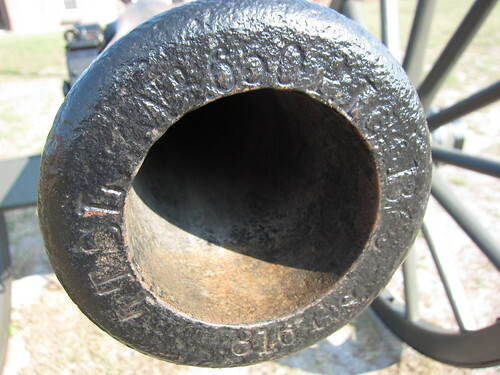 A 12-pdr Napoleon, registry number 90 from Henry N. Hooper & Company, representing the 9th Massachusetts Artillery at Gettysburg’s Trostle Farm, provides a good example of such a bouch. In bronze pieces, the heat and current of gas through the vent melts out and carries away the tin, rapidly widening the aperture. For this reason the vent is made in a vent-piece of pure copper screwed into the gun, which enables us, when the vent becomes too much enlarged, to replace it by another. When the charges used are very small, and the projectile not very heavy, no vent-piece is used. 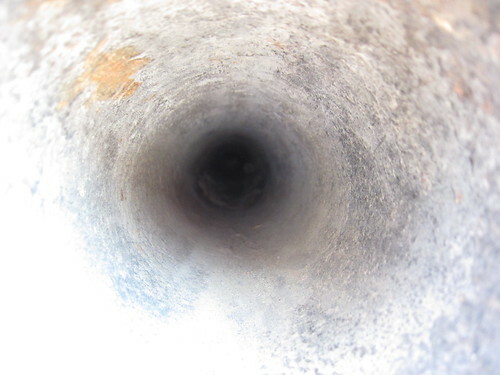 In iron pieces the vent is made in the metal itself. However with the introduction of rifles, even the iron guns suffered from rapid vent erosion. I’ve mentioned in the past that 4.5-inch Ordnance (Siege) Rifles suffered due to the lack of bouching. The Army specified that Phoenix Iron Company bouch the smaller 3-inch Ordnance Rifles before delivery. A common sight on those guns is a slightly off color circle of metal around the vent. And often enough, the vent-piece shows sighs of erosion. Less common, but encountered enough for notice, some guns are missing the vent-piece today. In the case of number 737, there’s a squared off section, possible due to erosion, that narrows down to the chamber. This may seem like a trivial detail. 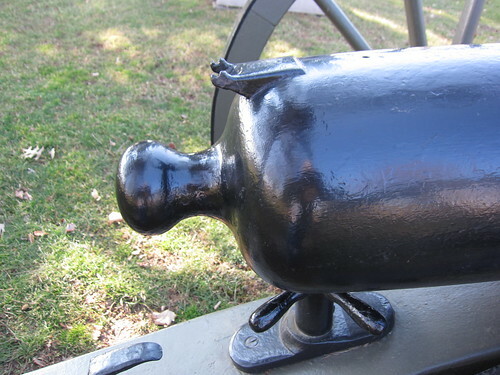 But the vent was arguably the weakest point of the gun. If the vent enlarged, the primer would not seat properly. 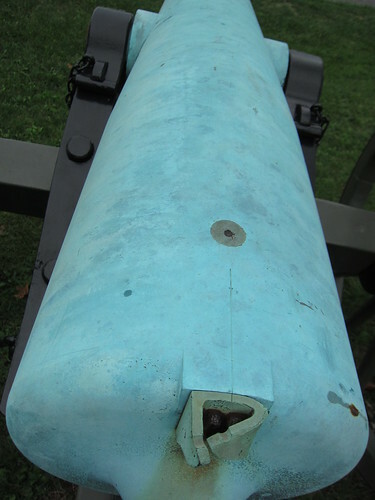 An enlarged vent also allowed excess gas to escape, reducing the gun’s performance. 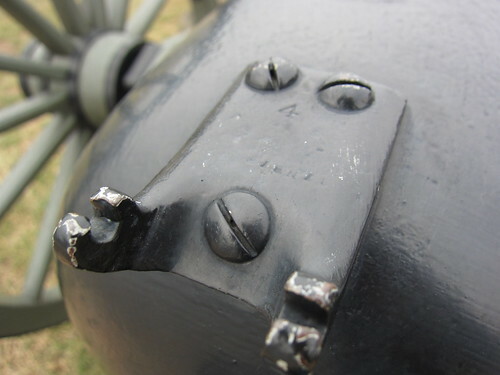 The Army’s Ordnance Manual called for vent repairs when the diameter exceeded 0.3-inch. 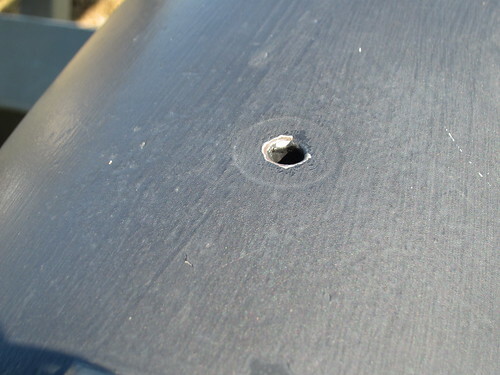 For guns with a vent-piece, the repairs involved unscrewing the eroded vent-piece and replacing it. 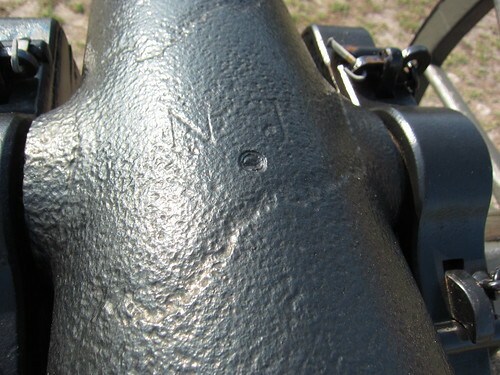 For older guns without the vent-piece, the manual required the old vent filled with zinc. A new vent was then drilled a few inches away from the original. 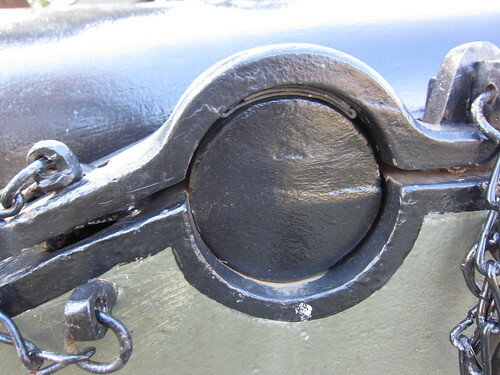 But thinking back again to the guns on the battlefields today, many of them have vents within the 0.3-inch tolerance. I don’t think we can directly attribute that to the strength of the metal. Perhaps more so to the thrift of a post-war Army.